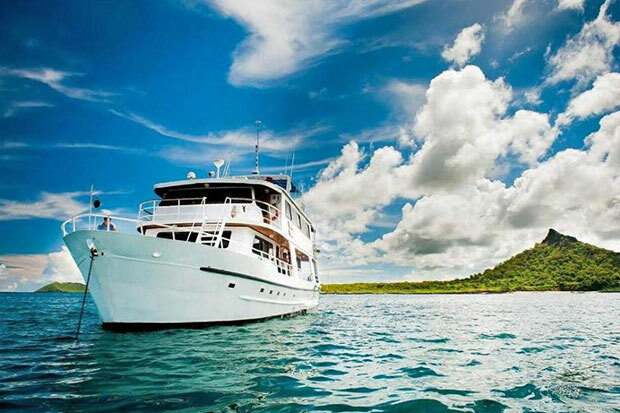 The Fragata is a spacious and comfortable owner-operated motor yacht that accommodates 16 passengers in cozy double, matrimonial and single cabins, all decorated and equipped to provide guests a relaxing cruise in the Galápagos Islands. Fragata welcomes you on board and invites you to discover the pristine habitat of the unique animals and primeval flora and fauna of the Galápagos archipelago. Eight double cabins (matrimonial, twin and bunk beds), private bathroom with hot water, air-conditioning, living room, TV, DVD, mini library, dining room, bar, ample sundeck. The boat and crew offer a relaxing atmosphere and attention to detail. The passengers are the first priority, and while the experience of the islands is the most important, we want to facilitate and enhance your Galápagos experience by providing a wonderful ambiance.